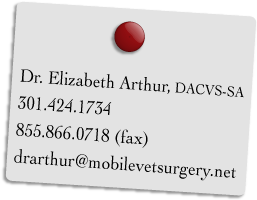 Mobile Veterinary Surgery is a surgery service for dogs and cats in Maryland. 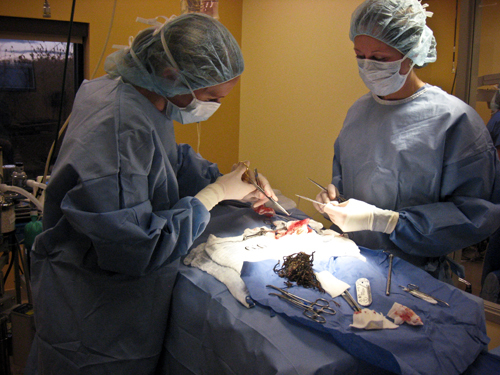 We provide surgical care for many orthopedic, soft tissue, and neurologic conditions in the comfort of local veterinary practices. Working as a team with family veterinarians allows us to provide seamless individualized care for our patients and make specialized surgical expertise accessible outside the referral hospital setting. We are committed to surgical excellence and dedicated to our patients’ comfort, bringing surgical knowledge and skill with warmth and compassion. Welcome to the MVS website. 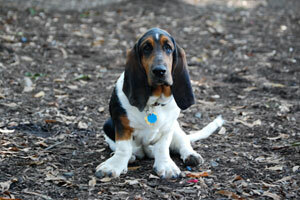 MVS is based primarily in Montgomery County; visits throughout Maryland can also be scheduled. 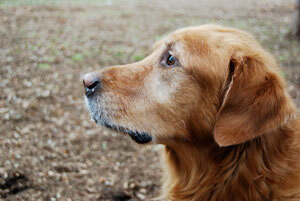 We look forward to working with your family veterinarian to help care for your pet. Please call or email with questions or worries.